So, one great thing about having a house is…having a yard. My yard is nothing special at all. It’s certainly nothing like Abbey‘s, another blogger who lives in the same city as me and whose blog pics I regularly drool over. But, with this yard, and with my intent to save money, I’ve been trying to grow some vegetables. The tomatoes have been an unequivocal success. I made salsa with them (Alton’s recipe with a few modifications – minus the chili powder and plus some dried minced garlic) and it was so GOOD. I could literally have eaten/drunk/bathed in a vat of it – delish! 🙂 And, besides doing a little weeding, the excellent amounts of rain we’ve received lately have made them so easy to take care of. 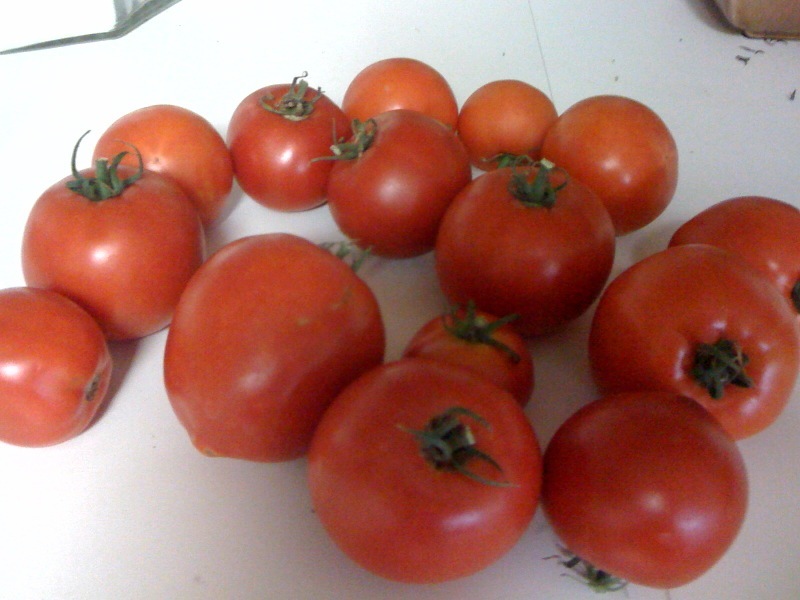 Here’s a pic of some of the “fruits of our harvest.” I go out and pick big handfuls of them every day. But, beyond tomatoes, I seem to be helpless. I planted some bell pepper plants and despite vigilant care, they have already shrivelled and died. And this following picture is the most depressing exhibition of plant life I have ever seen. I thought I would save so much money by just planting a few simple fresh herbs. Just a little basil, a little rosemary, a little oregano. Easy, right? Then, we’d have lots of extra flavor in our food without paying grocery store prices for little bundles of fresh herbs, right? Apparently not. I have no idea how to revive them. Water doesn’t work. Putting them in the sun doesn’t work. Putting them in the shade doesn’t work. Eek. Poor plants. Anybody out there with a green thumb and a few words of advice? I would really love to revive these plants instead of having to go and purchase new ones, only to let them die also. As of right now, the inside of my house is officially declared a plant danger zone until further notice. This entry was posted in Domesticity, Frustration, Fun with Food. Bookmark the permalink. 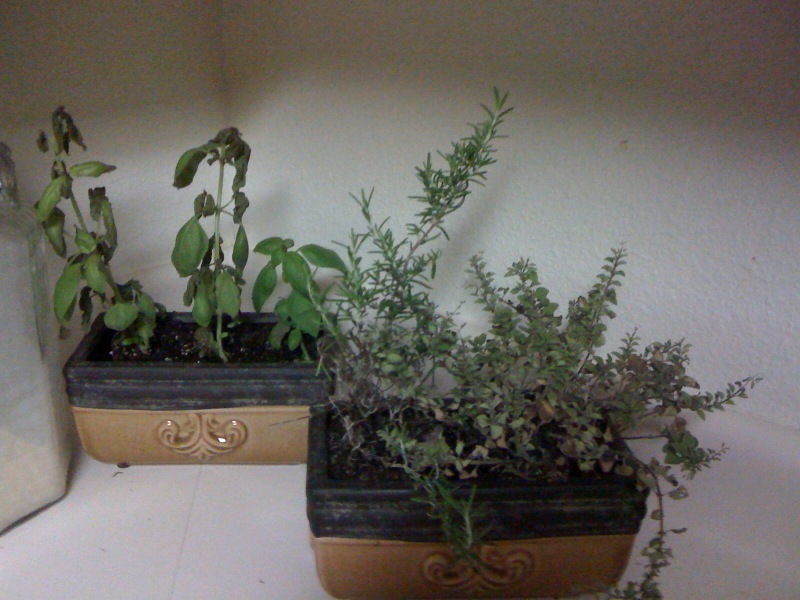 I am really new to gardening myself, but I have had success with herbs for the last couple of years. Basil needs to be watered every day. I leave my basil out doors where it gets morning sun, but plenty of shade as the day goes on. I think it’s the hardest herb to grow. Rosemary is pretty hardy. It doesn’t need a lot of water and can take plenty of sun. Not sure about oregano, but I would guess that it’s somewhere in between basil and rosemary. I am jealous of your tomatoes. They look awesome! I had a lot of success with strawberries and jalapenos this year, and I am definitely going to try my hand at tomatoes next year after seeing your harvest! PS I would love that starbucks card! I’ll send you my address by email. Thanks so much – the tomatoes are SO good. I’m jealous of your strawberries – pics please! 🙂 And, thanks for the advice on the herbs. Hopefully my next attempt at them will be better because I love cooking with fresh basil! If it makes you feel better, I have trouble with potted herbs and bell peppers too. Next year, try banana peppers instead. (They are the ones that come with Papa John’s Pizza.) Their shape looks a little like a jalapenos, but the taste is mild like a bell pepper, but so much easier to grow. I have two sets of basil outside. The one in a pot is thin and wilty and the three in the ground are 2 feet tall by 2 feet wide and a bit too vigorous. Every winter, I get an itch to start planting but it’s too cold to start a young plant outside so I try to grow something in a pot in a window. It keeps me entertained, but it never works out for very long. The home magazines always show people with fresh herbs in pots in the kitchen window. It looks so convenient, but it’s never worked out for me. Thanks for the plant advice. As of this morning, the basil has completely kicked the bucket, so I may have to try some outdoor planting next time! And I LOVE banana peppers – so I’m definintely going to try those next year. Thanks for the advice! Yeah, it’s called the Texas heat. I lost all of my herbs, pepper plants, and even my little tomato plant in the last month. No amount of water or shade would help because once that white hot sun peaked around the corner, they were fried!! We did enjoy lots of mint and basil earlier this summer and even got two whole tomatoes! It’s a balcony garden so what do you expect. Also, we had white flies and tried the soapy water thing to kill the pests. It worked on a few plants, but the bugs kept coming back, so we bought an organic pesticide to get rid of them. Worked like a charm and we could still enjoy the veggies/herbs. Good luck with your garden-tending!